Written on May 30, 2013. – Home-style meals like Chicken and Noodles, Fried Tenderloin and biscuits and gravy. This may have been more because of my health conscious mother. But, my friends weren’t eating these things either. Either way, I still had no clue these stick to your ribs, country favorite’s existed. – The Colts. Not even kidding. Every Sunday, everyone in my dorm wrote “COLTS” on their dry erase boards on their room doors. I remember wondering if it was a weird acronym for club or something. I had to ask my RA. Again, I came from Ohio. Central Ohio. College Football was all that mattered. – A Hoosier. Still not really sure what that one is. Clearly, I went to the school in northern Indiana. Not the one in the sourthern part of the state. Perhaps you know of that school…?! – U-Turns. These I had heard of, but never had done one. My freshman year roommate, an Indiana native, did one the first time I was in the car with her. As we were whipping around I was frantically looking for cops and thinking she was the most reckless driver ever. But, they are legal here. And so convenient. – Morels and mushroom hunting. Mushroom hunting for one, just sounds ridiculous. But it’s a thing. A super competitive, intense thing. Morels are a wild growing mushroom that are actually considered a delicacy. 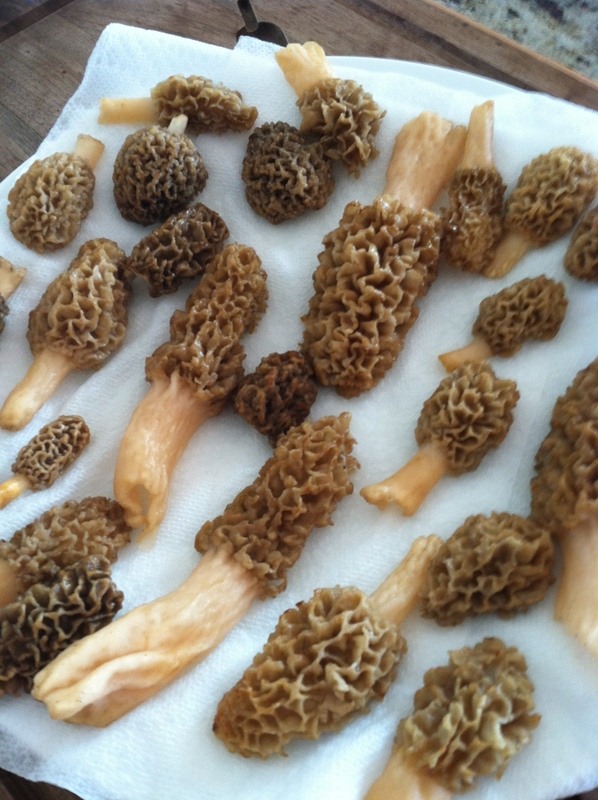 Between the notoriety morels and mushroom hunting receives each spring throughout the state (radio stations actually have contests to see who can find the largest mushroom) to Barbara Kingsolver’s, Animal, Vegetable, Miracle account of this spring vegetable, I knew I had to try them. Adam has friends who enjoy mushroom hunting. He even would show me pictures that came across his Facebook Newsfeed when people posted the finds from their hunt. I really wanted to try them. But, spring was crazy. There were weddings, a lot going on at work, both my siblings had college and high school graduations and we were putting our own garden together, so mushroom hunting never happened. Not that I was that disappointed. Woods and me? We don’t mix that well. 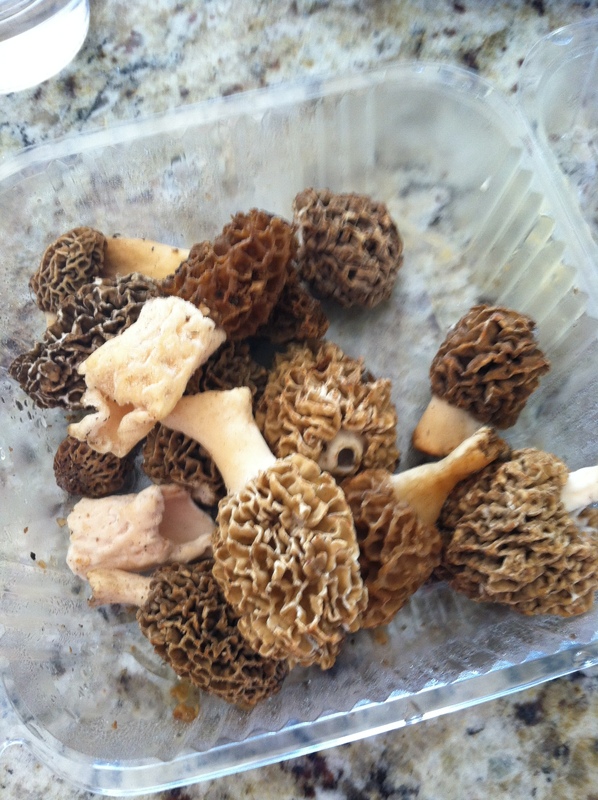 Plus, there was a sign outside an Amish farm stand not too far from work said that they had morels. I figured I would just swing by there. That was until a peer mentioned how she spent $48 on a pound of morels there. Fifty bucks? Seriously? I was going to HAVE to find time to hunt next year. A few days later I was driving on the west side of Indianapolis and passed a farm stand with a sign saying that they have had morels for $18 a half pound. A deal in comparison to the morels closer to home, so I stopped. I went back to the fridge full of little cartons full of cap shaped mushrooms of all sizes. The looked like coral or honeycomb. I wasn’t really sure what I was looking for, but I figured I should make sure they were free of any mold of decay just like any other produce. I checked out and got back in my car. As I drove away I glanced down at the little clear carton and kicked myself for not asking where they came from. Once home I looked up the Animal, Vegetable, Miracle website to find the morel recipe that the book recommends. (I rented the book from the library around Christmastime. Highly recommend. Very eye opening and a great thing to read if you want to get started in growing your own food or just want to try to be a little more self-sufficient.) The recipe was for Asparagus and Morel Bread Pudding. Another thing I had never been exposed to: Bread Pudding. So, that was a big “no” for the bread pudding. 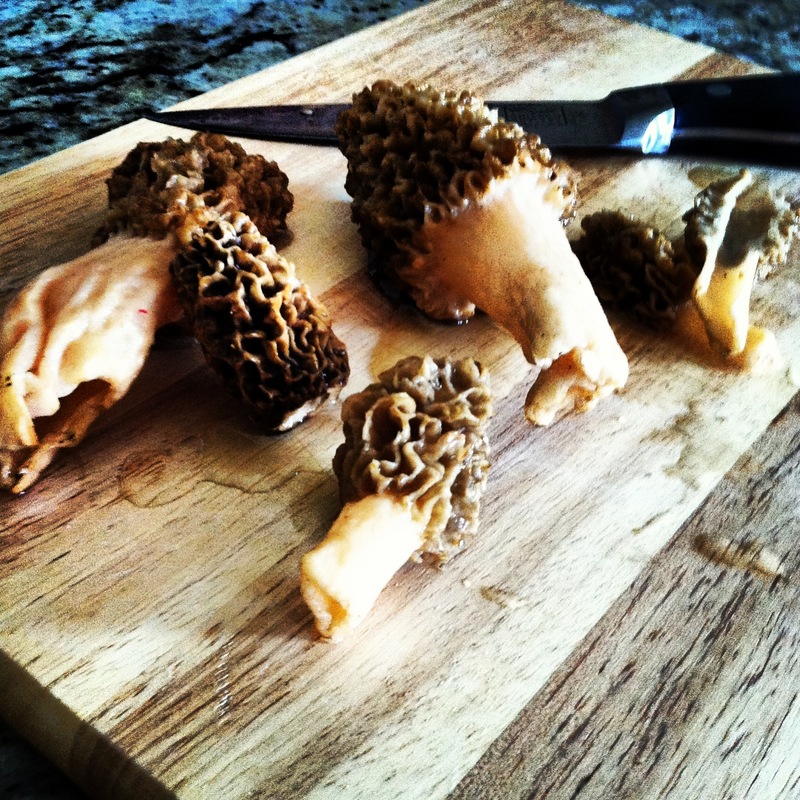 Plus, I really wanted to experience what the morels really taste like. Not have them masked by a lot of other ingredients. So, with Google as my guide, I looked up morel recipes. There were a ton. 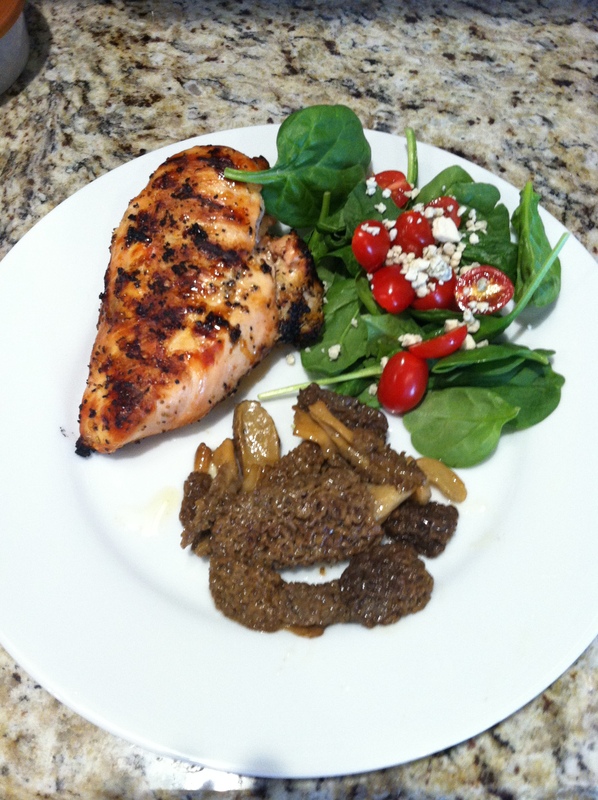 Recipes that included chicken or adding the morels to pasta. Recipes for soup and different ways to deep fry them. 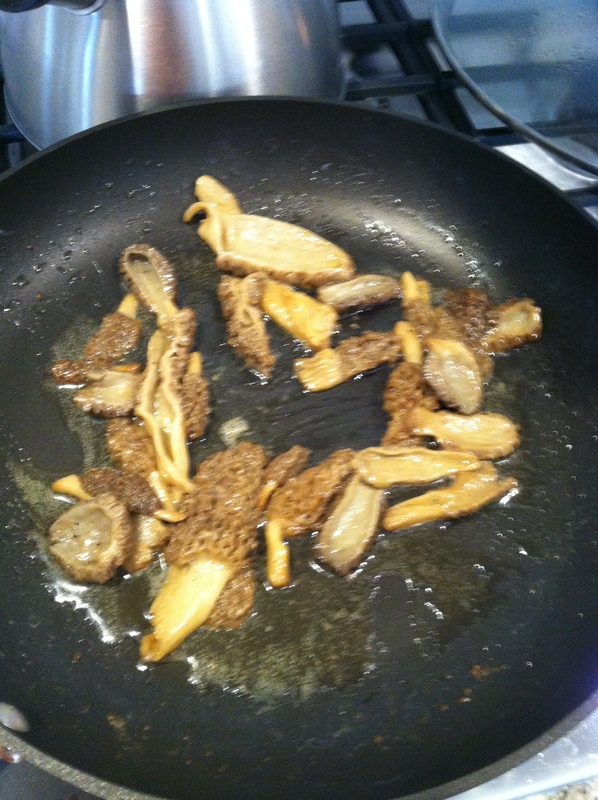 I opted for a super simple recipe of just sautéing the morels with some butter and salt and pepper. 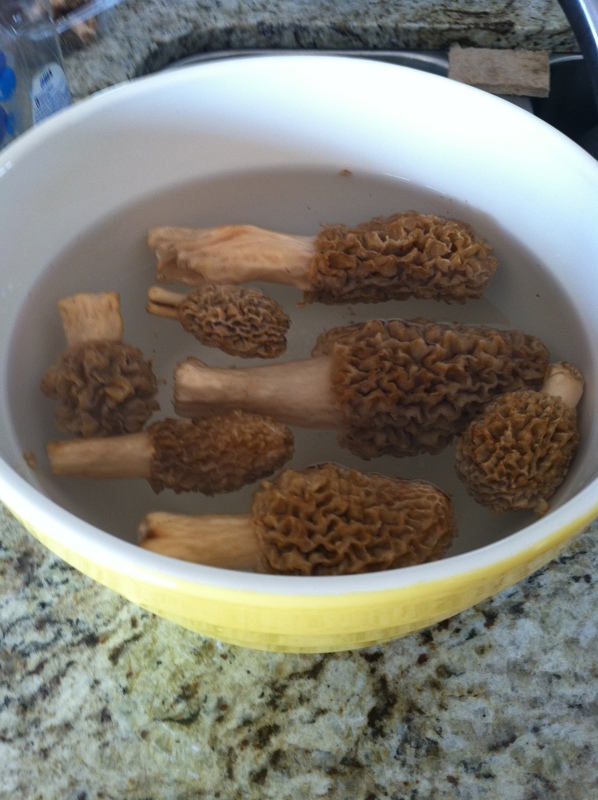 The first order of business was to clean the morels. You don’t want to wash them, but you do want to brush them off and then soak them in salted water for about fifteen minutes. It was at this step I read that one should not be alarmed if bugs or other debris, like dirt, comes out of the mushroom and is floating in the water. Because of this, I changed the water about ten minutes in. Didn’t want to take any chances! Next I cut the morels in half, lengthwise, and laid them on paper towels until they were dry and didn’t leave any wet marks on the towels. Then I added the mushrooms to four tablespoons of melted butter in a skillet over medium heat. The morels cooked quickly as I pushed them gently around with a spatula. Adam came in with chicken off the grill and we plated the food, after he commented on how great the kitchen smelled. I am looking forward to it because I would gladly do this recipe again. …. Or maybe I will get adventurous, fight my childhood food-fear and make bread pudding.